Once more, I am going to assume that for this Custard Tart, you have premade the Shortcrust Pastry base using the recipe in the "Pastry" section of this website. To make the custard, mix together the eggs, vanilla essence and sugar. Bring the milk to the boil, remove from the heat and gradually pour onto the egg mixture. 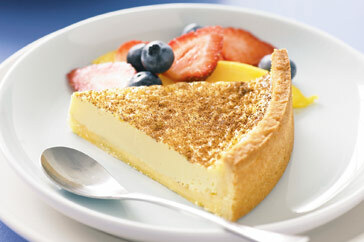 Place the pie plate on a baking tray, strain the egg mixture into the pastry case and sprinkle with ground nutmeg. Bake for 40 minutes, or until just set in the centre. Allow to cool, and serve cut into wedges.